Euphorbia is a very large genus of plants, with over 2,000 species. About 1,200 of them are succulents, some with bizarre shapes and wide fleshy leaves and others that look remarkably like cacti, complete with spines. Among the the non-succulent deciduous Euphorbia plants are shrubs, annuals, and perennials like milkweed and the popular holiday plant, Poinsettia. Euphorbias are popular as popular for their structural intrigue as for their drought tolerance. Use the tall angular varieties for focal points and the floppy or chain-like species to spill over containers or walls. Many succulents have infrequent or inconsequential blooms, but Euphorbias will provide color in dry gardens for long periods of time. Mixing them with groupings of Senecio and Agave will create a garden full of texture and leaves of gray, blue, yellow and deep green. Soil: Euphorbias need well-draining soil and lots of sunlight. They are not particular about soil pH, but they cannot tolerant wet soil. Water: Unlike most succulents, Euphorbia does not handle long periods of drought well. It may need weekly watering during the summer. Water whenever the soil is dry several inches below the surface. Water deeply, but don’t let them sit in wet soil, which can cause root rot. Feeding: Add some organic matter or fertilizer to the planting hole. If you are growing them in containers or your soil is poor, feed with a half-strength fertilizer monthly. Euphorbia can be grown from seed, but they can be difficult to germinate (or even find). It is usually propagated by cuttings. This can be tricky, because of the exuding sap. 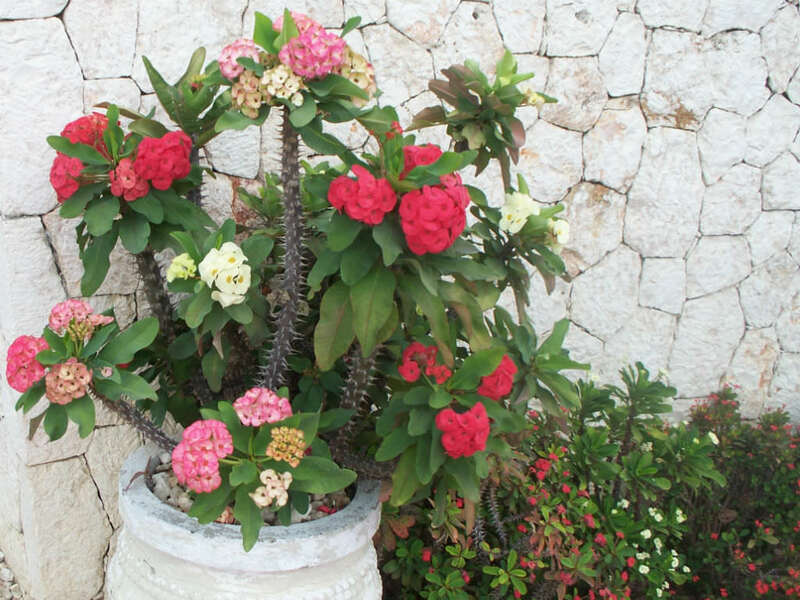 Rooting hormone is recommended with Euphorbias. Mealy Bugs and Spider Mites are the most common pests. Catching them early is your pest chance for controlling them. Root Rot was mentioned above. It is only a problem when plants are allowed to sit in wet soil. Powdery Mildew – Although Euphorbia like humidity, they also need good air circulation or they will be susceptible to mildews. Try correcting the cultural conditions first, because strong fungicides can harm leaves.